Van de felle lichten van Las Vegas tot de adembenemende pracht van de Grand Canyon, deze driedaagse trip vanuit Anaheim heeft het allemaal. Nadat je de glitz van de beroemdste stad van de woestijn hebt verkend, kun je genieten van een gesproken busexcursie naar de prachtige South Rim van de Canyon. Klim aan boord van je moderne motorcoach en reis comfortabel van Anaheim naar Las Vegas. Tijdens de rit van 4,5 uur kunt u ontspannen en genieten van de rit, samen met de onlangs uitgebrachte films die op het geavanceerde entertainmentsysteem worden getoond. Vanaf je opstapplaats bij Harrah's Hotel in Las Vegas moet je je eigen weg banen naar de Tropicana Las Vegas, die je thuisbasis zal zijn voor de komende twee nachten. Trek eropuit voor wat vrije tijd in de stad en ervaar de neonglitter van de beroemde strip van de stad. South Rim Bus Tour: vanuit Las Vegas is het een opvallende, schilderachtige reis naar het South Rim National Park in de Grand Canyon. Met pluche stoelen, toiletten en ramen met een prachtig uitzicht op het landschap, biedt deze luxe bus tour een historische vertelling van de Hoover Dam, de Indiase oorlogen en het leven van cowboys en pioniers. Onderweg stop je bij de beste en meest exclusieve uitkijkpunten voor een adembenemend uitzicht over de Canyon Rim. Voor degenen die echt comfort in combinatie met prachtige natuurlijke schoonheid waarderen, is deze tour ideaal. Na een inbegrepen lunchbuffet in het Kaibab National Forest Area, eindigt je tour met een drop-off in Anaheim. You have to see it to experience the true wonder of everything about the Grand Canyon,the tour from when we left our hotel in Anaheim to when we returned was faultless.Our hotel in Vegas ,the Tropicana,was first class,and Vegas was just wonderful, this tour has made us want to return very soon.couldn't find a fault with any part of the trip.The next time we go it will be for longer and will definitely use Viator again. Very good. Thoroughly enjoyed it! Comfy trip from Anaheim to Vegas, fun rep on coach. Did not feel like 5 hour trip. Tropicana hotel fantastic, right on strip close to MGM and New York New York, Great view from club tower room. Grand Canyon trip was a long but very enjoyable day, great guide/driver Tess. Would highly recommend. Only after I confirmed my booking with the vendor by phone did I find out that this so-called 3-day tour is actually not the kind of packaged tour I imagined, such as having 1 single contact point or guide throughout the whole tour. As the vendor is just a bus company, when I called them to confirm they could only confirm the pick up time and place for my transfer between Anaheim and Las Vegas. 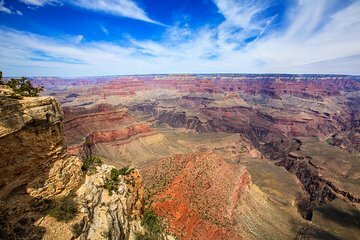 The hotel stay and Grand Canyon tour were on separate vouchers which I had to liaise with 2 other vendors on my own the hotel itself and the Grand Canyon tour provider respectively. The bus rides, the hotel and the Grand Canyon tour were not bad but it's a bit inconvenient for me to liaise with 3 parties separately and a bit disappointing taking into account that I actually only booked 1 tour via Viator. I expected 1 company to take care of all elements of the 3-day tour with a single point of contact etc. Las Vegas was phenomenal and fantastic. My hotel Tropicana was very comfortable. The Michael Jackson One Show at Mandalay Bay was out of this world, the dancing was fabulous ! Enjoyed my time there. This was a great way to see Las Vegas and the Hoover Dam and Grand Canyon. Just wish we had more time in Las Vegas. The Grand Canyon Tour is a very long day but we really enjoyed it. A lot of this was done to Mark our tour host and Bus driver that day. The trip from Anaheim to Las Vegas was really good. Thanks to our driver (sorry didn't get your name) and to Natasha our host from Lux Bus. Natasha certainly made this a really informative interesting and amusing trip. The trip to Los Vegas was very good, the bus company certainly looked after you. However the hotel...was a building site...dirty and smelling of smoke! in addition to this, the trip from the Canyon was hindered by the bus having a tyre blowout.....we had to wait 2hours on the side of the road fro repairs. The trip allows 2 hours to view the Canyon and takes 5-6 hours to get there. I would not recommend this to anyone. You would be better to fly to Flagstaff and hire a car from there....this allows a better choice of accomodation and more time at the Canyon.